So Rough, They Switched To Rugby! The Cardinal stopped the Golden Bears for the second straight year, but what made this game notable was that it was the last Big Game played under football rules for the next 15 years. So rough was the play on the field that after this season was over, both Cal and its Palo Alto rivals decided to switch to rugby as a presumably kinder and gentler way to spend an Autumn afternoon. And while the Golden Bears returned to the "American" game in 1915, the Cardinal persisted in the "English" game until finally relenting in 1920. 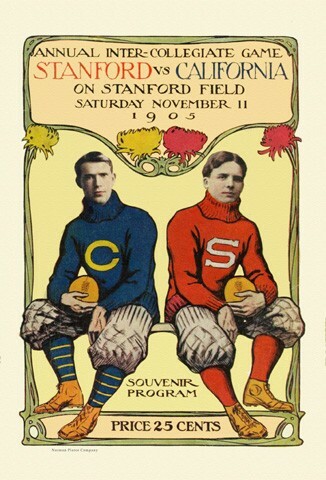 In the interim period, Cal staged its "Big Game" against Washington, while Stanford played its "Big Game" against Santa Clara.